I did an interview overnight with a WSJ journalist from London on the ‘political’ aspects of Modern Monetary Theory (MMT). This blog post covers some of that conversation, although I started writing this a few weeks ago. Regular readers will recall I was promising a post about the ‘nimbleness’ of fiscal policy. That promise instigated the request from the WSJ. When I write about Modern Monetary Theory (MMT), I try to be careful to distinguish between what we might consider the core MMT principles (theory, description, accounting) and the imposition of my own values (political and otherwise) that is informed by those core principles. That separation is important and should (but doesn’t) stop others misrepresenting the core principles by appealing to proposals that might flow from the value imposition. An example of this separation (and confusion), a topic which I receive many E-mails from people which seek clarification, is the concept of setting up an independent fiscal authority. The proposal to establish such an authority is not a core MMT principle. It might reflect an opinion that has been expressed by someone writing about MMT but that is as far as it goes. For the record, I am deeply opposed to establishing such an authority. It would constitute the continuation of the neoliberal practice of depoliticisation and further increase the democratic deficit that is common in our nations these days. Politicians are elected to take responsibility and make decisions on our behalf. Can we trust them? We have elections to deal with those issues. Should technocrats rule? Technocrats do not stand for election. They give advice but have no democratic responsibility. Is fiscal policy agile enough to be an effective source of counter-stabilisation against the non-government spending cycle? That is what this blog post is about. This is Part 1 of a three-part series. Part 2 will be published on Monday. 1. Consider the question as to whether fiscal policy is sufficiently flexible enough to provide an effective counter-stabilisation against the non-government spending cycle. If a nation is heading into recession, can governments act quickly enough with discretionary spending changes? If a nation is ‘overheating’ and inflation is threatening to accelerate, can spending and tax changes be implemented quickly enough to counter these tendencies? 2. Should fiscal policy be outsources to technocrats, who work independently of the political cycle and stop politicians from making political decisions that might not be economically sound? 3. Is MMT a flawed paradigm for policy development given that a progressive application of its principles, relies on politicians understanding the operations of the monetary system and the capacities that the currency-issuing government possesses and to use those capacities to advance the public interest rather than sectional interests or their own venal political survival? These are all issues that have been raised in some of the critiques of MMT over time and warrant attention and response. In Part 1, I will consider the first of the questions above – the flexibility of fiscal policy. Monetary policy is a blunt-policy tool with uncertain impacts. It operates through relative unknown interest rate impacts, which first have to work through shifts in non-government sector behaviour, which then manifest as shifts in spending. The time lags in these shifts are unknown as are the impacts. For example, it is often assumed that lower interest rates will stimulate business investment, on the basis that lower costs of finance will render marginal projects, that under higher rates were not profitable enough, now profitable. However, as we have seen in the aftermath of the GFC, borrowing volumes remain relative low despite nearly a decade of low to zero interest rates. Why? Because investment decisions are based on a range of factors, of which the cost of funds is just one. A firm will not invest, no matter how low the funding costs go, if they do not think they can sell the extra output that the increased productive capacity would produce. That is just one example of why monetary policy is not a very effective counter-stabilisation policy tool. However, economists started producing many articles in the 1970s and after, to justify the growing dominance of Monetarism and the associated attacks on discretionary fiscal policy, which claimed that fiscal policy was subject to time lags which would render its application dangerous. The argument has been that fiscal policy is an inflexible tool as a result of supposed timing lags in design, implementation and result. Overlaying that critique is the claim that politicians cannot intervene at appropriate times in the cycle because of political constraints or because they are captured by sectional interests. More recently, this line of attack has been used against MMT proponents – by both the mainstream macroeconomists (Krugman, Rogoff, Summers, etc) and those on the Left who proudly call themselves ‘sound finance’ progressives, even Marxists. A neoliberal progressive is equivalent to being one confused dude! Apparently, MMT is politically naive because fiscal policy would not be able to, say, increase taxes and/or cut spending quickly enough at a time the economy was entering an inflationary episode. Quite apart from the fact, that MMTs anti-inflationary strategy goes well beyond the use of discretionary spending and tax shifts, it is true that we do advocate discretionary shifts in fiscal policy as a primary counter-stabilisation strategy to maintain price stability with full employment. So how does that square with the arguments that the required flexibility is a pipe dream? In other words, just how agile or nimble is fiscal policy? The answer is very nimble. In what follows I provide some recent examples where fiscal policy has been very ‘nimble’ and significantly influenced the economic cycle. Here are two real world examples, that operate in opposite directions to the cycle. In this speech by an Australian Treasury official (June 24, 2009) – Australia’s response to the global financial crisis – we gain some idea of the workings of the Australian government in relation to fiscal policy and the GFC. … the Government announced a $10.4 billion stimulus package, which for Australia is around 1 per cent of GDP. The package was comprised of $8.7 billion that would flow to pensioners and low-income families in the form of cash bonuses, $1.5 billion to support housing construction, and $187 million for new training places. So a relatively significant fiscal stimulus combining recurrent and capital aspects. The fiscal package was directed at the economy’s weak sectors, which at that time were consumption and housing. With housing and consumption representing over 60 per cent of the economy, it was thought important that these weak sectors were supported. There is now strong evidence that these aspects of the stimulus package provided substantial support to the economy. The cash handouts meant that early in December 2008, around 9 million Australian workers earning $A100,000 or less received up to $A950 (a sliding scale where the maximum was paid to workers receiveing less than $A80,000). It jokingly became known as the ‘flat screen TV’ stimulus! It was designed to help boost Xmas spending patterns and provide some confidence for firms who were facing a meltdown. The first graph shows the monthly growth in Australian retail sales from January 2005 to December 2010. The red bar is the intervention month when Australians were given a $A960 cash hand out from the Federal government as the first step in the stimulus package designed to subvert the GFC in Australia. Monthly growth in December 2008 was 4.1 per cent while the average monthly growth over the period April 1982 to January 2019 (the current available data) has been 0.4 per cent. Only once before was the monthly growth higher than 4.1 per cent (June 2000) and that was also associated with a fiscal intervention – the month before the GST (consumption tax) was introduced in July 2000. In that case, consumers brought forward consumption purchases before the tax would hike overall prices. If I was looking for a single piece of evidence that the fiscal intervention increased retail sales I couldn’t find a better graph to demonstrate that. The second graph gives a better view of what happened before and after the fiscal intervention in December 2008. The straight black lines are linear (regression) trends). You can see clearly the step jump in retail sales during December 2008. After that period, the trend increased on the trend the behaviour immediately prior to the fiscal stimulus. Fiscal policy in Australia was very responsive and provided a very effective counter-cyclical boost to growth. As a result, Australia was one of the only advanced nations that avoided a technical recession during the GFC. That was all down to the significant fiscal intervention. The next example shows how quickly tax increases can be introduced and their significant and rapid effect on spending and production. 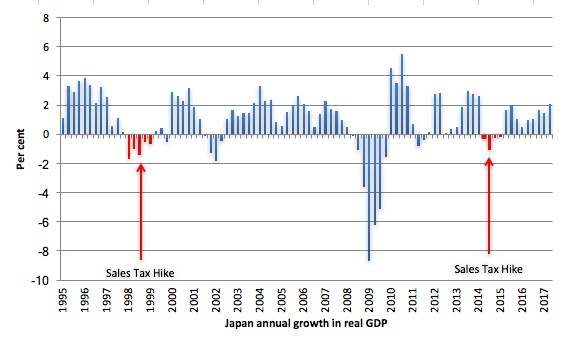 The case in point is the sales tax increases in Japan in 1997 and again in 2014. Now don’t start quoting me that I agreed with these interventions. They were ridiculous and reflected the pressure that neoliberals were putting on the Japanese government to introduce unwarranted fiscal austerity. While the policy interventions were destructive, they do show how quickly tax increases can be introduced to slowdown economic activity. That is the point here. 1. The last eruption of Mount Fuji was 305 years ago (May 28, 2013). 2. Japan returns to 1997 – idiocy rules! (November 18, 2014). 3. Japan – signs of growth but grey clouds remain (May 21, 2015). 4. Japan is different, right? Wrong! Fiscal policy works (August 15, 2017). The property crash in th early 1990s caused a severe contraction in household consumption and private investment spending which culminated in a brief real contraction in 1994. Once the stimulus from the expanding fiscal deficit began to work real GDP growth regained momentum. Real GDP growth on an annualised basis was gathering pace in 1996 – March-quarter 2.9 per cent, June-quarter 2.5 per cent, September-quarter 1.8 per cent, then December-quarter 3.4 per cent, sustained into March-quarter 1997 3.3 per cent. There was strong growth in private business investment and housing construction. By 1996, the same neoliberal calls for austerity (fears about public debt ratio etc) that dominate the policy debate today were rampant in Japan. We were told that Japan was about to collapse, that bond markets would shun the government, that interest rates and inflation would surge and that the government would run out of money. The government eventually bowed to political pressure and in 1997 introduced a contractionary fiscal intervention, which included sharp sales tax increases and cutbacks in public spending. The Japanese government hiked sales taxes from 3 per cent to 5 per cent in April 1997. The results were almost immediate and a palpable reminder that fiscal policy is effective in both directions. The economy, which was showing some signs of recovery given the fiscal support, nose-dived. Expenditure growth declined by 0.7 per cent in 1997. The public contraction on top of very fragile private sector spending caused a massive contraction in 1997 and 1998 – which increased the fiscal deficit (via the automatic stabilisers) and added to the public debt ratio (given both debt was rising and GDP was falling). That was the situation that Moody’s then started to play games by downgrading the sovereign debt. Fortunately, the Japanese government did not take any notice of the agencies and realising the mistake of 1996-1997, expanded their net spending again. The renewed fiscal stimulus saw real GDP grow very strongly in the ensuing years despite the rating agencies decision. The Japanese government never had any trouble finding buyers for the debt it was issuing, they held complete control over interest rates, inflation fell, unemployment remained relatively stable and real GDP growth was strong through the period of the downgrade. The decision by Moody’s was rendered irrelevant by the Japanese government who just exercised the power they had as a sovereign issuer of the currency. At the time, the neoliberals claimed the tax hike had nothing to do with the prolonged recession that followed – 7 negative quarters of growth in the next two years – which also entrenched the damaging deflation that Japan has had to face. The claims were that the Asian financial crisis were to blame. But a closer examination of Japan’s export performance at the time categorically discredits that claim. The net exports deficit fell over the period of the recession, mostly due to a collapse in imports as the domestic economy waned. See this blog post – Japan returns to 1997 – idiocy rules! (November 18, 2014) – for more details on this. The lessons from history are often ignored, especially when Groupthink denies them. Japan was growing strongly in 2013 and into 2014 on the back of significant post-GFC fiscal support. And, predictably, the likes of the IMF and OECD were continually hectoring Japan to increase sales taxes to raise more government revenue in order to reduce its fiscal deficit. The IMF was raving on about “growth-friendly” fiscal consolidation but on my reckoning (at the time) it was looking like 1997 all over again. Once again, these ideologues continued to propagate the myth that monetary policy is an effective expansionary tool, despite all the evidence that it is not. On April 1, 2014, the Japanese government increased the sales tax from 5 per cent to 8 per cent and foreshadowed a further rise to 10 per cent in October 2015. After the sales tax hike, there was a sharp drop in private consumption spending as a direct result of the policy shift. At the time, I predicted it would get worse unless they changed tack. It certainly did get worse. Consumers stopped spending and the impact of static consumption expenditure was that business investment then lags. Here is the history of real GDP growth (annualised) since the March-quarter 1994 to the March-quarter 2015. The red areas denote sales tax driven recessions. In both episodes, these recessions were followed by a renewed bout of fiscal stimulus (monetary policy was ‘loose’ throughout). In both episodes, there was a rapid return to sustained growth as a result of the fiscal boost. In Part 2, I will go onto to discuss the other questions that I posed in the beginning of this blog post. This event is being organised by GIMMS and will run from 14:00 to 17:00. The event will be held in – The Library of Birmingham, The ICC, Broad Street, Birmingham. Following the launch in March of the textbook ‘Macroeconomics’ and in anticipation of the inauguration of the MMT training college later this year, the event will focus on giving academics, teachers and the wider public the tools with which they can take a more critical approach to the subject by comparing and contrasting heterodox and orthodox approaches to theory and policy. Join us for what will, without doubt, be an informative event aiming to challenge our preconceptions about how money works and how such an understanding offers a lens through which we can develop solutions to the pressing economic, social and ecological issues we face. Tickets are £11.25 (including Eventbrite fee) and can be purchased HERE. Note: Neither Warren nor myself are receiving any payment for our presentations. The tickets go to cover the venue costs. The overall stimulus package allowed Australia to escape a recession while most other economies went under. Usually, the construction sector leads the way into the downturn. During 2008-09, the construction sector kept growing. Why? The school buildings part of the stimulus. So, it was very clear that the stimulus worked. The problem was that it was withdrawn too early (by Swan in 2012). I’m shocked that anyone properly in tune with MMT would suggest an independent fiscal authority, so I’m glad you’ve squashed that idea Bill. It sounds like the “independent” central banks, only worse. It also sounds like something Positive Money might come up with. Thank you for this article Bill, I was wondering about just this issue recently. What would be an example of a tax hike or spending cut that could be done quickly to address inflation without having regressive impacts? On matters of fiscal policy, the Australian government has apparently just announced a budget surplus in time for the election – it won’t save their political skins (they are going to be trounced) but they will get to hand the incoming Labor government a nice recession to preside over (unless Labor actually utilises their fiscal capacity to prevent it – I would like to think they would but I will need some convincing). Another example: The Economic Growth and Tax Relief Reconciliation Act of 2001 signed by George W. Bush on June 7, 2001, which included rebates of 2000 taxes of $300 for single filers and $600 for joint filers, was a rapid response to the recession (March 2001) caused by Bill Clinton’s budget surpluses in fiscal years 1998-2000.